Overview: Ranked #30 in 2005’s INC 500 list, MDVIP is setting the new gold standard for healthcare. 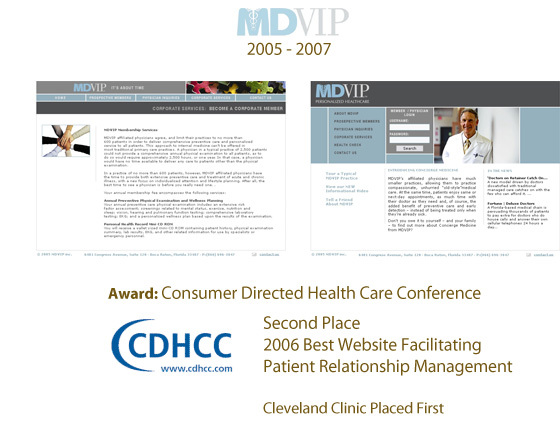 Commonly viewed as concierge medicine, MDVIP’s care actually goes far beyond concierge. MDVIP Doctors limit their practices to 600 patients to deliver personalized medical attention focused on prevention and wellness, backed by early detection and state - of - the - art treatment and condition management. Project: Re-conceptualize corporate online visual presence by adding balanced design elements and using complimenting strong colors, appropriate images and softer movement. 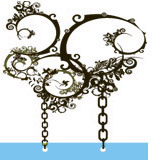 Solution: Strategic and organized design layouts incorporate defined photo selections, with expert photo editing and professional photo retouching, designs materialize into an award winning website that skillfully utilizes key word selection and copy editing for proper website optimization. Complimenting collateral materials establish a stronger corporate identity and company branding.